Dartfishes are members of the Ptereleotrinae subfamily, encompassing seven genera. Dartfishes are a commonly kept aquarium species due to their small size, amenable personalities and bright coloration. The Common Fire Fish (Nemateleotris magnifica) is one of the most commonly sold dartfishes in the aquarium hobby. Other commonly sold members of the dartfish family include the Purple Firefish, Helfrichi Fire Fish (Nemateleotris helfrichi) and Scissortail Dartfish (Ptereleotris evides). Dartfishes are found in the Atlantic, Indian and Pacific Oceans. They can range in size from 2” (5cm) to 5” (12cm). Dartfish tend to be found living in groups, hovering just above the substrate. They sped their days feeding among the water column but will quickly dart into the safety of their individual burrows, or bolt holes, at any sign of danger. Dartfish can make great aquarium inhabitants provided their husbandry needs such as diet, water quality and tank space are met. Dartfish prefer a temperature range of 72F (22C) to 80F (26C). Dartfish are generally considered reef safe. It is advisable to provide Dartfish with amble rockwork with plenty of caves. Additionally, Dartfish tanks should be well covered as they are known to jump when frightened. It is important to consider carefully what species of dartfish may be best for your aquarium. 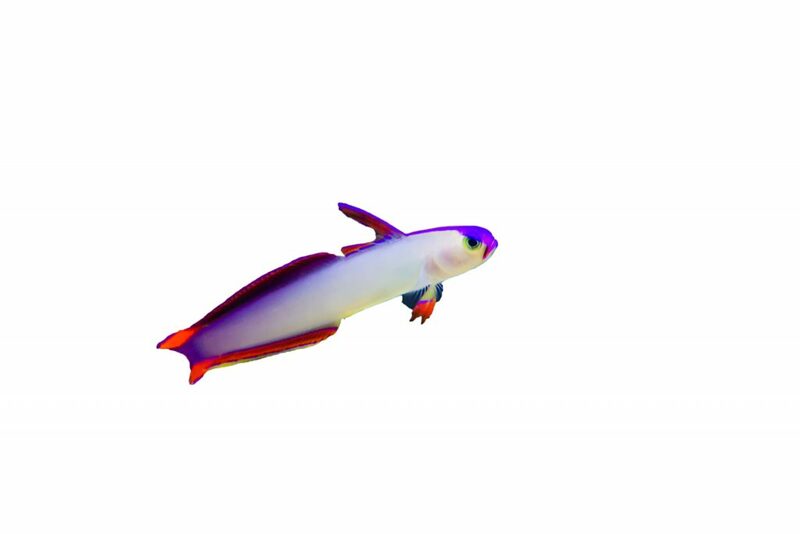 While smaller species such as the Purple Firefish (Nemateleotris exquisita) are suited to tanks as small as ten gallons, larger species such as the Lined Dartfish (Ptereleotris grammica) may be better suited to a larger tank. We suggest a diet based on Piscine Energetics Mysis, Piscine Energetics Calanus, Piscine Energetics Pellets (1mm) and Piscine Energetics Saltwater Flakes.